The chimney sweeps of Chimney Solutions Peachtree City provide a range of chimney services like chimney repairs, chimney inspections, chimney cleaning, fireplace insert & stove installations, and mantel & surround installations in Peachtree City GA and the surrounding area. The reliable chimney sweeps & techs of Chimney Solutions have been proudly serving Peachtree City, Fayetteville, Tyrone, and Fayette County GA since 1997. Homeowners residing in Peachtree City GA and the Greater Atlanta area trust in the professional chimney experts at Chimney Solutions. 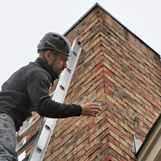 All of our chimney sweeps are CSIA trained and certified and can handle a range of chimney & fireplace services like chimney liner installations, chimney cap replacement, chimney crown repair, chimney cleaning & annual chimney inspections. CS of Peachtree City is fully insured and our chimney sweep technicians always meet the highest of industry standards set up by the Chimney Safety Institute of America. 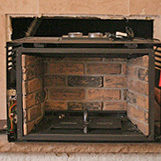 Count on us to be prompt, clean, and coutesy when we arrive to your home to perform any chimney related service. Our distinctively marked chimney sweep trucks can be seen traveling Rt 54, Rt 74, Peachtree Parkway through Whitfield Farms and Windgate Forest, down to Wickerhill and Holly Grove Rd. We gladly travel all over Peachtree City to provide local homeowners with high quality, reliable chimney sweep services at a fair price. Our chimney sweeps are always on time, in a work vehicle, and will provide a fair written estimate for any recommended work or repair services. 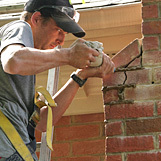 Chimney Solutions of Peachtree City is proud to be the chimney sweep company of choice in the Greater Atlanta area. We always stay up to date on the most current industry training and are good standing members in the National Chimney Sweep Guild and the Chimney Safety Institute of America. Don't believe us? Ask any of our previous customers for recommendations and referrals! Homeowners should be careful to avoid a common scam that affects the chimney sweep industry. Some unqualified "companies" known as "cheap sweeps" bait homeowners into securing their services by promising low prices for a generic chimney inspection or cleaning. Once a homeowner agrees to purchase the low-cost service, the company will send an untrained / non-certified worker to perform a quick cleaning or fake inspection. Their main goal is to then upsell the homeowner into expensive "immediate" repairs so they can pad their pockets at the expense of their customers. In most cases, there aren't any actually problems with the chimney or venting systems, but these unscrupulous companies know that homeowners are not educated to the anatomy of their chimney and cheap sweeps use this to their advantage. Not only is it dangerous to let these untrained & unprofessional companies to work on your chimney, you may be paying way more than necessary. Always check with a certified, highly rated and respected chimney sweep for a second opinion before you agree to any work. Chimney sweeps serve Peachtree City GA and the surrounding towns & communities and offer chimney, venting, fireplace, stove, and fireplace insert service. Jul 22, 2016 by Karl F.